My Bright Firefly: Native Americans and Turkeys: Invitation to Play with Play Dough and Feathers. Same and Different Color. 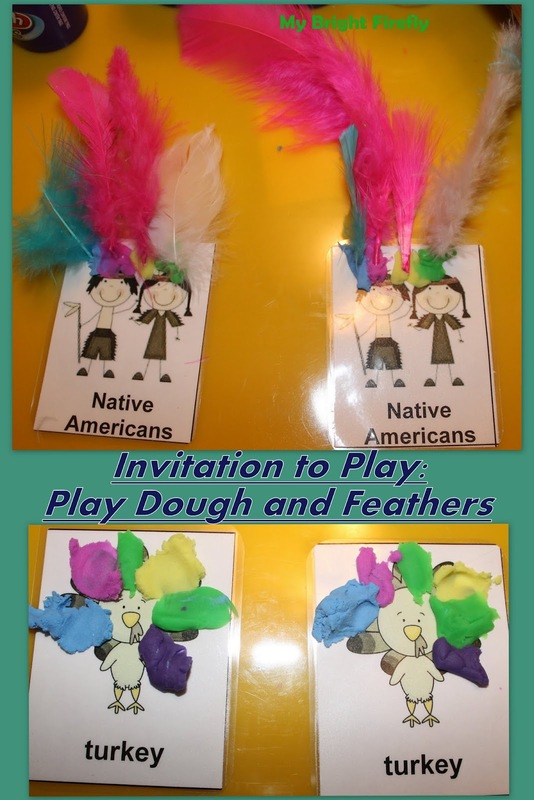 Native Americans and Turkeys: Invitation to Play with Play Dough and Feathers. Same and Different Color. Native Americans and Turkeys all dressed up in colors and feathers during our play dough play activity. The concept of same and different is helpful for little ones in so many ways. We had some fun pages before, but playing and building same and different objects using small parts takes the understanding and manipulating this concept to the new level. My Firefly loved these little activities! We compared the cards and found out that they are the same. Practicing the pincer grip with play dough can be fun! 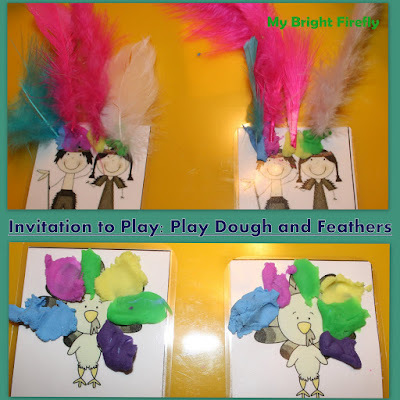 My Firefly pinched out small pieces of dough and stuck them to give colorful feathers to the Indians. We paid attention to keep the feathers the same colors on both pictures. Place feathers making sure that the pictures are the same. One player closes his/ her eyes. Another player changes one of the feathers to a different color. The first player opens eyes and tries to find the difference. Make the cards look the same again. We played for quite a while! The game seems simple with only 4 feathers to compare. In reality, it requires some skills in patterns, and finding same and different. After mastering comparing 4 feathers on Native Americans, we switched to 5 feathers on turkeys. This considerably increased the difficulty level. Placing 5 colors on a second turkey following the pattern of the first one was done with my assistance. But "Spot the Difference" game (see above) became more exciting yet! We had fun working on finding same and different colors on Native Americans and turkeys - off to the same and different shapes and sizes next. Preschool Math can be exciting! You can find out previous preschool Math activities here: Introduction to Graphing for Preschoolers. Composers. Swan Lake Painting and Hand Print Art.